EURUSD is under the influence of some news factors such as: Italian Prelim CPI m/m, CPI Flash Estimate y/y, Spanish Flash GDP q/q, French Consumer Spending m/m, German Retail Sales m/m and Unemployment Rate for EUR and for USD, the US is going to release its economic data such as Employment Cost Index q/q, Personal Spending m/m, Personal Income m/m, and Core PCE Price Index m/m therefore this pair is going to be more active today. There is no clear pattern for now and this pair is moving in neutral zone. 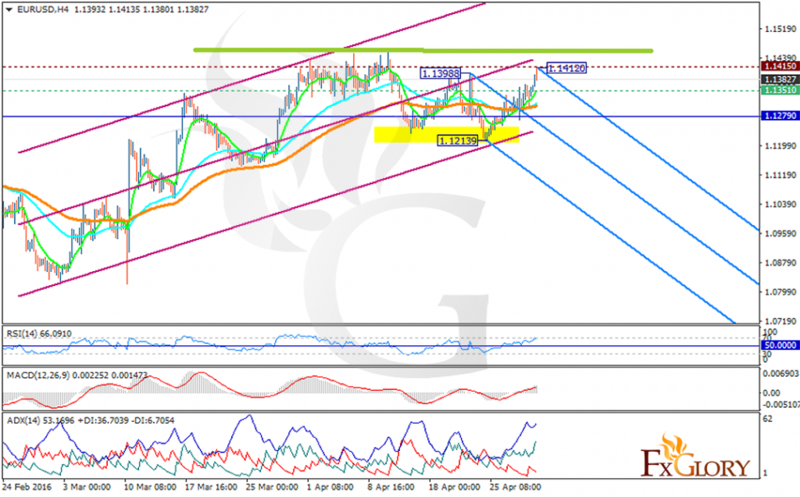 The support rests at 1.13510 with resistance at 1.14150 which both lines are above the weekly pivot point at 1.1279. The MACD indicator is in positive territory as the price is increasing. The RSI is above 50 level and the ADX is showing powerful buyers. The EMA of 10 is located above the EMA of 50 and 100. It is testing the previous highs and there might be a pullback falling along with the Andrews’ pitchfork after reaching the resistance. There is no confirmed signal for this pair at the moment but short term traders can open their long positions remembering that pullback is getting close paving the way for bears.